I hope everyone is having a great week! Hopefully, this menu planning is helping everyone plan their week and staying more organized while saving money! The Mediterranean food on their sales ad makes me so excited!! Mix all the top ingredients together, then mix the salad dressing separately. Add dressing to taste. Refrigerate rest for dipping veggies or pita bread. I’m sure if you don’t use all of it, it won’t be wasted! In a 6qt or large crockpot, mix the chicken, sausage, tomatoes with juice, onion, green bell pepper, celery, and broth. Season with oregano, parsley, cajun seasoning, cayenne pepper, and thyme. Southwest Hawaiian Roll Turkey Sliders are bursting with flavor and easy to make for a crowd. Layers of turkey, pepperjack cheese, and green chiles are sandwiched between Hawaiian rolls and drizzled with a butter sauce. And oh that spicy mayo! Make your spicy mayo by whisking together mayo, paprika, cayenne, curry powder, and salt in a small bowl. Cut slab of rolls in half, separating it into two slabs. Spread mayo over bottom slab. Sprinkle the bottom slab with half of the pepperjack cheese. Layer on all of the sliced turkey. Spoon green chiles on top. Sprinkle with remaining pepperjack cheese. Top with other slab of rolls. Place in a lightly greased 9x13 pan. In a small bowl, whisk together melted butter, poppy seeds, dijon mustard, onion powder, and worcetershire sauce. Drizzle butter mixture over the top of the compiled slab of sandwiches. Loosely cover the pan with aluminum foil. Bake at 350 degrees for 10 minutes, or until cheese is completely melted. Serve hot. Slow Cooker Chicken Tortellini Soup is your favorite chicken noodle soup but 1000X better with pillowy, cheese tortellini and super easy made in the crock pot! 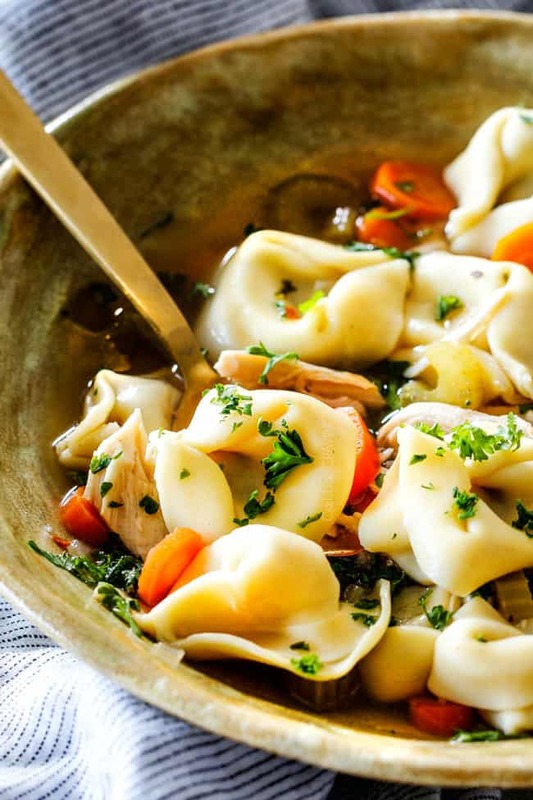 This Chicken Tortellini Soup is bursting with juicy chicken, cheesy tortellini and veggies in a steaming hot, savory, salty, perfectly seasoned broth that might leave you never wanting classic Chicken Noodle Soup ever again. Add uncut chicken to the bottom of a 6 qt. slow cooker, followed by vegetables. Add all of the remaining ingredients except for the tortellini. Give the top ingredients a stir. Cover and cook on low heat 6 - 7 hours or on high for 3-4 hours OR just until the chicken is tender enough to shred and the vegetables are tender. Remove chicken to a cutting board and let rest for 10 minutes. Meanwhile, add tortellini to the slow cooker (turn to high heat if on low) and cook approximate 15 minutes. (DON'T add tortellini if you are not serving immediately, rather wait 15 minutes before you are going to serve). Shred chicken and and add back to slow cooker with tortellini. Tortellini should be about cooked by this time. When tortellini is completely cooked, taste and add additional salt and pepper if desired (I like quite a bit more salt). For a less chunky soup, add additional chicken broth. Serve warm. Heat one tablespoon olive oil in a large Dutch oven or stock pot over medium high heat. Once hot, add onions and cook 3 minutes. Add carrots, celery and garlic and cook an additional one minute. Add chicken and all remaining ingredients EXCEPT tortellini and simmer until chicken is cooked through and tender, approximately 20-25 minutes. Remove chicken to a cutting board and let rest for 10 minutes then shred. Meanwhile, if your veggies aren’t fork tender, then continue to simmer the soup. Once tender, add tortellini and simmer just until tender, about 3-5 minutes. (DON'T add tortellini if you are not serving immediately, rather wait 5 minutes before you are going to serve to add and simmer). Taste and add additional salt and pepper if desired (I like quite a bit more salt). For a less chunky soup, add additional chicken broth. Serve warm. Hopefully this meal plan helps save some time and money:) Enjoy!